I always looked forward to those rare and special nights when my mom dragged out her big electric mixer and the glass and metal bowls and wooden spoons. Soon the kitchen countertop would be covered with bags of flour and sugars, syrups, shortening, butter (it was always margarine, but we called it “butter”), eggs, nuts, sprinkles, chocolate, vials of food colorings and flavorings, shredded coconut, candied cherries. The first time I can remember staying up into the wee hours was during a marathon cookie-baking session. It felt important somehow: taking that long to do something, staying up so long past bedtime. I was standing on tip-toe, rubbing at a cloudy window to get a short, quick peek into adulthood. The world did not stop turning at 9 p.m.
At first there was not much I could do besides crack an occasional egg or mix something or carefully—very carefully—tap out just a couple drops of food coloring. Just a couple things here and there until I got bored and ran off. As I got older, there were more tasks for me. My favorite was grinding nuts. Mom sat across the table and cracked the shells and dug out the walnuts and pecans and Brazil nuts and hazelnuts, and I dropped them into the grinder (and, when Mom wasn’t looking, into my mouth) and turned the little crank to chop them up into the little glass jar. It was a lot of work, but I think buying the nuts unshelled was much cheaper than buying them prepared. Still later, I helped my mom involve my younger brothers and sister. They could help cut out star- and tree- and gingerbread man-shaped sugar cookies and drop spoonfuls of preserves into the thumbprint cookies and press Hershey’s kisses into the peanut butter cookies. We made coconut-cherry bars, Russian tea cakes, frosted nuts, cream cheese cookies that folded up like little fruity burritos. 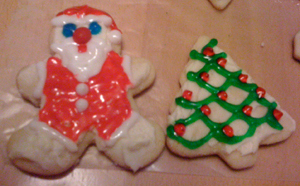 We once tried peppermint-flavored cookies, twisting together two snakes of red and white dough. Chocolate-chip cookies never seemed so dull and unimaginative as when my mom was baking. There was no reason not to make every variety from her oil-streaked and stained cookbooks and various handwritten notes from friends and relatives. We didn’t do much baking the rest of year, so come Christmastime, it needed to be a grand production. It was as essential as a Christmas tree, as lights on the eaves of the roof, as carols and Midnight Mass and the Nativity. The possibilities were limitless. The counter space was not. And then, hours and hours later, we would have to pack them all up between layers of waxed paper in the round cookie tins that we seemed to collect more and more of each year. My favorites were the grown-up-looking ones with Victorian fireside and sleigh ride scenes printed around the sides. For a short time, we used a cookie shooter. It appealed to the little boy in me to have a machine shaped like a gun that shot out little blobs of shaped cookie dough. But it broke or a piece went missing or something, and we stopped using it after a few years. What stuck, and what still sticks, are the time-consuming hand-made recipes. There’s something satisfying about the labor. The two main differences now are that my mom and I are 600 miles apart, and that I, lazy as I am, buy shelled walnuts and pecans. I enjoyed reading about your Christmas memories. I’m glad we made them together. Love You!